The OLD Big Dead Sidebar: Daily Dosage: Isn't She Lovely? I've already shouted out my editor and the newest member of the siuDE sports desk in earlier editions of the Daily Dosage, but today I'm doing something for myself. It's not Carrie Underwood's most glamorous shot, but oh. my. goodness. she is still hot. Maybe it's just my twisted sense of attraction, but there's just something I love about a girl who loves baseball. 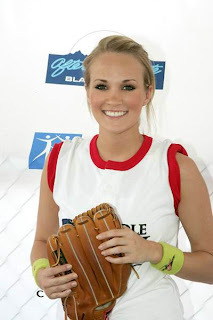 I can't honestly tell you if she loves baseball or not, but she's got a mitt in her hand and that's good enough for me. Seriously though, I'm a sucker for a girl that can carry a conversation about any sport. You like Derrick Rose and the Bulls, let's talk. You think Kyle Orton is the Bears' best QB since Jim McMahon, let's grab coffee. You think Alfonso Soriano should be dropped in the order to fully capitalize on his monstrous power numbers, let's hit up a Wrigleyville bar. Now, if Carrie and I can have a conversation in which we both come to the conclusion that OPS should replace batting average as the preferred stat to judge a hitter then I'm getting a ring and lockin' her up. Enough of my rants, on with the Dosage! What do you mean the Bears were on a by week? I guess after scoring 48 points, offensive coordinator Ron Turner is looking for a way to minimize the Bears' scoring options. Eli Manning and Kevin Boss will get the all the credit for hooking up on the game-winning touchdown in the New York Giants' 21-14 victory over the Pittsburgh Steelers, but running back Brandon Jacobs deserves an award for best supporting role. Jacobs delivered the key block that allowed Manning an extra moment to find an open Boss in the end zone. And where did he learn how to deliver monster blocks like that? At THE Southern Illinois University, of course. BJ27 didn't have his greatest game on the ground, rushing for only 47 yards on 18 carries, but I'll forgive him. He's still a beast. Another disappointing effort for another SIU grad. But don't tell him I said that, he might put a hit on me like he did for Hines Ward. Scott only made two tackles in the Baltimore Ravens' 29-10 victory over the Oakland Raiders. Eh, I'm not sure what else to write here except Scott is one of the angriest linebackers in the world and if I ever got into a fight, I would hope he was on my side. A bonus for all of you Joe Six Pack's out there playing a drinking game ... Maverick!